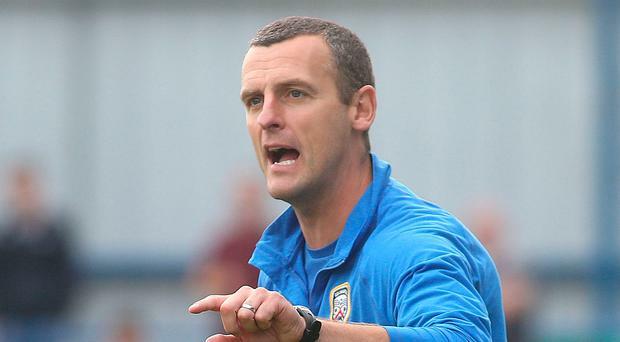 Oran Kearney is set to make an announcement about his future today, with the Coleraine players expecting him to leave the Showgrounds and become the new manager of St Mirren. The Bannsiders boss has been thinking hard about moving to the Scottish Premiership club since being offered the St Mirren hotseat on Wednesday, and the feeling in Coleraine is that it is too tempting an opportunity for Kearney to turn down. While chairman Colin McKendry, the board, the players and the fans would be sorry to see him go, they understand the lure of going to full-time football and going toe-to-toe with huge clubs such as Celtic and Rangers and high profile bosses such as Brendan Rodgers and Steven Gerrard. St Mirren's next match is a league game at home to Celtic in front of the BT Sport cameras, so it could be quite an introduction for the 40-year-old ex-Linfield player. It is understood that a three-year deal is on the table for Kearney, who last season led the Bannsiders to Irish Cup glory and almost to the league title, being pipped by Crusaders on the final day. Rather than accept the job immediately, Kearney has taken time to consider all aspects because he has a young family and wants to ensure him moving to Scotland would work for them, especially with his two children having started a new primary school. Kearney was interviewed for the St Mirren job in the summer but they decided to appoint Alan Stubbs because he had more experience in Scottish football as a player with Celtic and manager at Hibs. While Kearney was leading Coleraine to the top of the Danske Bank Premiership on Monday with an impressive 3-0 victory at Crusaders, Stubbs was getting sacked less than three months into the job with St Mirren second bottom in the league table. It didn't take long for St Mirren to move in on Kearney, asking Coleraine chairman McKendry for permission to speak to the man initially recommended to them by Northern Ireland boss Michael O'Neill. Kearney has been at Coleraine since 2011 and has had some rough times when supporters called for his head but McKendry kept faith and was vindicated for his decision. By the weekend the Bannsiders could be looking for a new manager unless there is a sudden change of heart by Kearney overnight. Kearney’s father-in-law Kenny Shiels knows the Scottish scene well from his time as Kilmarnock boss and feels he could be a hit. “He’s organised and that’s the kind of manager you want,” said Derry City boss Shiels. Prior to his interview in the summer, as part of Kearney’s research he spoke to Celtic boss Rodgers and Hibs manager Neil Lennon. Kearney’s presentation of where the club should look to progress in the future and how youth development ought to be a key element left a lasting impression on the big hitters at St Mirren. McKendry said last night that Kearney was still pondering his decision but admitted that it was a golden opportunity for his manager. Former St Mirren striker and BBC Scotland pundit Steven Thompson commented: “He’s still a very young manager. “It’s going to be a very big decision for Oran. He’s a very big family man, he’s got to take that into consideration. “I think he has a full-time job so there is so much to consider. But I also think it’s a great opportunity and if his long-term goal is to be a successful football manager then at one stage he’s going to have to move.